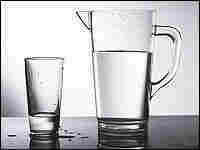 Five Myths About Drinking Water Is bottled water better for you than tap? Or should you choose vitamin-enriched water over sparkling? Experts say, skip it all. None of these products are likely to make you any healthier. Is bottled water better for you than tap? Or should you choose vitamin-enriched water over sparkling? Experts say, skip it all. None of these products are likely to make you any healthier. Below, we look at five major myths about the benefits of drinking water. But first, how do you know if you're drinking enough water? Experts say there's an easy way to judge. If you're not thirsty, your fluid intake is likely "just right." Scientists say there's no clear health benefit to chugging or even sipping water all day. So where does the standard advice of drinking eight glasses each day come from? "Nobody really knows," says Dr. Stanley Goldfarb, a kidney expert at the University of Pennsylvania. The kidneys filter toxins from our bloodstreams. Then the toxins clear through the urine. The question is, does drinking extra water each day improve the function of the kidneys? "No," says Goldfarb. "In fact, drinking large amounts of water surprisingly tends to reduce the kidney's ability to function as a filter. It's a subtle decline, but definite." The body is already 60 percent water. So, if you take a 200-pound man, he's 120 pounds of water. Adding a few extra glasses of water each day has limited effect. "It's such a tiny part of what's in the body," says Goldfarb. "It's very unlikely that one's getting any benefit." His full editorial is published in the current issue of the Journal of the American Society of Nephrology. One study published in 2007 on the cosmetic benefit of drinking water suggests that 500 ml of water increases capillary blood flow in the skin. "But it's unclear whether these changes are clinically significant," says Goldfarb. A more accurate statement may be: Drinking water is a helpful tool for dieters. "Water is a great strategy for dieters because it has no calories," says Madeline Fernstrom of the University of Pittsburgh. "So you can keep your mouth busy without food and get the sense of satisfaction." But water is not magical, she adds. Other zero-calorie options such as diet sodas are fine, too. Dehydration sets in when a person has lost 2 percent of his or her body weight. So for a 200-pound man, this means losing 4 pounds of water. Marathon runners, bikers and hikers all need to recognize the signs of dehydration. "It is also obvious that individuals in hot, dry climates have increased need for water," says Goldfarb. The American College of Sports Medicine recommends that athletes drink 16 ounces of fluids a couple of hours before starting sports practice. But for a stroll in the park, no water bottle is necessary. Goldfarb's advice: Just drink when you're thirsty.